Somehow Charlie Crist manages to insult the base of the Florida Republican Party and Ronald Reagan during the same interview. 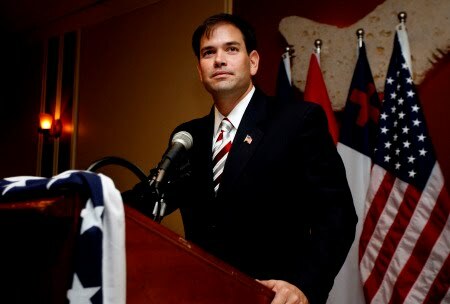 All the while reinforcing the support of his opponent Marco Rubio. Crist: "Campaigns thank God are an educational opportunity. During the course of the next nine months or so we will strive to lay out a very good education...I believe in Reagan's 11th Commandment- thou shall not speak ill of a fellow Republican - but I also think you need to be honest and truthful and make sure that before people go to the ballot box they have a good opportunity to be well-informed." Notice that Crist said "...we will strive to lay out a very good education...(for voters).Here is what Marco Rubio thinks abouth the fact that Crist thinks voters are stupid and unimformed. 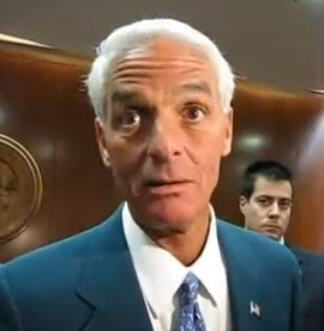 CRIST:"There are a lot of Republicans that don't have the inclination to go to executive committee meetings,'' he said. That is an obvious reference to the FACT that he has lost 14 straw polls in a row by HUGE margins. Crist:"There is wide swath of republican voters out there that don't necessarily listen to cable tv all the time." That is an obvious swipe at Fox news and the Tea Party movement. Want proof that Charlie does not get it yet? You have it right in front of you in his own words. Crist does not seem to understand that grassroots supporters and committee members are Republicans too. It's easy for him to ignore that because he is NOT a Republican. He just does NOT get it. You Sir are a RINO!!! UPDATE: Today the Rubio campaign has responded to Crist's attack on republicans/conservatives.